After a week spent backpacking in Dusy Basin, followed by an excellent day-hike to the top of White Mountain Peak, it was getting near time for us to head back home. Vacations don’t last forever. Sad, but true. Still, we knew that it would be an unbearably hot drive down route 395, crossing the Mojave Desert on a sunny August day in a car with no air conditioning, so we opted to spend the day at a higher elevation, where it was much cooler (more beautiful, too! ), and drive home in the dark of night. We decided to hike from the Onion Valley Trailhead, as we’d been there years before in a car, but hadn’t done any actual hiking. It was time to rectify that omission. After spending the previous six days backpacking in the Sierras, far above 10,000 feet elevation, Vicki and I decided that our bodies were acclimated enough to tackle White Mountain Peak, elevation 14,246 feet, the third highest peak in California. Except for the lack of oxygen, White Mountain Peak isn’t a particularly difficult climb, but the views sure are breathtaking! It’s probably the easiest fourteener you can climb, as there is a 4WD road to the top. Some people mountain bike up (and down!) this mountain. The only real issues in climbing it is the 7 mile approach and the oxygen concentration at that elevation. Still, being able to view the entire eastern Sierra at one time makes this mountain truly memorable. Besides, it was my first (and only, thus far) fourteener! Vicki and I took a visit to the Ancient Bristlecone Pine Forest while on our way to the trailhead of White Mountain Peak. We’d always wanted to visit these amazingly old trees, and this was our big chance. The lower, more famous grove was closed due to construction, so we decided to visit the upper, Patriarch Grove instead. And the trees were, indeed, amazing. 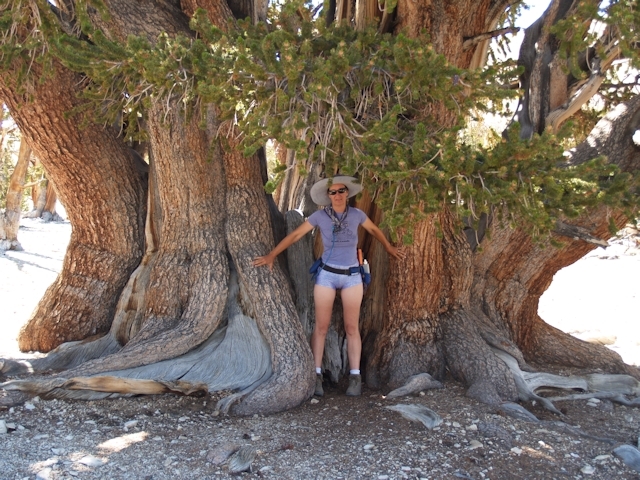 We got to visit “The Patriarch” tree, the world’s largest (but not oldest) bristlecone pine, up close and personal. And we learned a lot about the trees and ecology of the White Mountains. Fun! Click on the red “Day X” images to view that particular day’s Trip Report. Vicki and I backpacked into the Monarch Divide region of Kings Canyon National Park in August 2009. It was an eight day trek. It was also the culmination of a lot of planning, as we hadn’t done a long backpacking trip for several years, not since our sons were in the Boy Scouts. Coincidentally, it fell on our 25th wedding anniversary, so we decided to celebrate that, too.